With its third year, The Wire heads back to the streets and unfinished business. As with the second year, the third season opens up another dimension of the city, this time City Hall and the civil and police administration, but the focus is squarely back on the Barksdale organisation and Lt. Daniels' unit trying to bring them down and finish the job begun back in Season 1. Season 3 opens with Avon Barksdale still inside, but his parole hearing is coming up. His friend and collaborator Stringer Bell has guided the crew through some lean times and formed a 'co-op' with several other gangs which has led to them making some serious money but at the cost of sharing each other's turf. However, a new player, Marlo Stanfield, is on the way up and is not interested in sharing his territory with anyone else. The stage is set for a series of bloody showdowns and bodies dropping on the streets, to the growing discontent of the police. Lt. Daniels and his unit are forced to drop their investigation into Bell (begun at the end of the second season) to concentrate on the war, unaware that the two are connected. This war is complicated by the re-emergence of Omar Little, who has sworn to bring down Bell for manipulating him into shooting an innocent man in the second season. At the same time, an ambitious white city councilman, Tommy Carcetti, is planning to run for mayor, although his prospects in a city with a majority black population seem poor. Connecting these two storylines is a highly controversial initiative launched by police Major Colvin to move the drug dealers off the street corners into three abandoned city blocks where the police will turn a blind eye to their activities so they can concentrate more on murders and crime prevention elsewhere. The 'Hamsterdam' storyline, apparently inspired by the 'legalise drugs' movement, is a stunning and surprisingly even-handed piece of social commentary. There is also an ongoing subplot following the attempts of former Barksdale enforcer Dennis 'Cutty' Wise to go straight after spending fourteen years in prison. Season 3 is tighter than the second season, as it is able to link the storylines together more effectively than the second, where the trials of the Barksdale gang were largely removed and separate from events on the docks. The new characters, both on the streets and in the city hall, are also more directly tied to the storylines that have gone before and are stronger as a result. Thematically, the idea behind Season 3 appears to be that of failed reform. The failure of the city's drug prevention strategies encourage some radical, out-of-the-box thinking from Major Colvin. Whilst his policy is initially successful, it leads to a whole host of knock-on effects which are beyond his powers to address, and give a rather depressing impression that, indeed, no one man can make a difference to the system. The breathtaking cynicism and corruption of the political wing of the city is depicted, with Carcetti determined to reform the system from the inside, again with apparently little hope of success. Stringer Bell's attempts to reform himself and his friend Avon on his release from prison into respectable businessmen provides the season with its main narrative spine, but again does not have a happy ending. That said, there are moments of hope, with Cutty's attempts to go straight finally garnering some success and McNulty's attempts to straighten out his personal life ending on a positive note. The ending of the season seems to be a little more definitive than the prior two, but the writers take care to leave enough loose ends untied to be pursued into the fourth year, with the candidates for mayor squaring up, several of the gang leaders still very much at large and the police unit once again finding themselves heading off in separate directions. 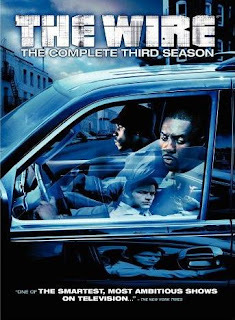 The Wire: Season 3 (*****) follows up on the first two by being just as dramatically intense with some superb characterisation, brilliant acting and some finely-judged moments of comedy to balance the darkness elsewhere. It is available on DVD in the UK and USA, and as part of the complete series box set (UK, USA).